Awhile back, reader Christy wrote in to ask me to offer up some healthy options at Taco Time. A couple of weeks ago, we were in Seattle for a quick weekend getaway, and I noticed quite a few of them around town. We didn’t stop in, though, since there are just so many cheat-worthy, creative, culinary experiences in Seattle, that a fast food chain just wasn’t on our to-do list. Anyway, Taco Time has over 350 locations in the United States, Canada, Curaçao, and Kuwait (huh?) — but still none in California, so it may be awhile before I actually try their food. Even so, with a quick glance at their website and nutritional information, it’s pretty easy to figure out the “better” and worst options on their menu. One word of warning: If you’re watching your sodium intake, you might do better to avoid this place completely. Most of their burritos are reasonable in terms of calories, but the sodium numbers are through the roof! All of the burritos — except for the ones that have been deep fried — have sodium numbers in the four digits. Many of them are 2,300mg or above — which is a full day’s allotment of sodium. They do offer a Whole Wheat Tortilla for their “Super Soft” tacos (all of which ended up in the “worst” category due to sodium) — which adds 4 grams of fiber, so it probably has a fair amount of whole grains. Perhaps they can use that for a burrito instead? 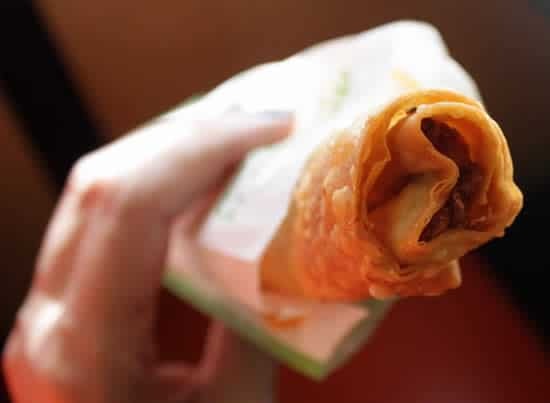 Even though they’re deep-fried, the “Crisp” burritos seem to be a bit better than the other options — since they’re lower in calories and sodium. But if you look closely, you’ll see that they’re also significantly smaller than the other burritos — so one might not be enough to keep you satisfied. As with most choices at chain restaurants, it seems there’s a trade-off here. I’ll have to leave that for you to decide what’s more important for you. This is the only burrito on the menu that is reasonable for both calories and sodium, and has not been deep fried. Far too much sodium, but it’s better than most of the other burrito options. I hate to put the veggie burrito in the “Worst” category, but with that much sodium, there’s no other place for it. I hate to put a bean burrito in the “Worst” category, but with that much sodium, there’s no other place for it. See my note above about the Crisp burritos…they’re small and deep fried. They offer four types of tacos — “Crisp,” which has a hard shell and only comes with ground beef (You can add sour cream, but please don’t); “Soft,” which is a soft flour tortilla and looks more like a burrito; Super Soft,” which looks to be like the soft tacos, just bigger; and “Street,” (I can’t find any online information on those other than the nutrition numbers). So, I’ll just do this by the numbers. The Crisp Ground Beef taco is only 4 ounces, while the Soft and Street tacos are 7 ounces. Size matters. I’m guessing most folks will order two of the Crisp tacos — and once the numbers are doubled, they’re not looking quite as good. I found this on the kids’ menu and it’s the only vegetarian option that’s acceptable on both calories and sodium, so I’m going to put it in the “better” category, even though it’s just melted cheese in a flour tortilla. This is a small salad in a friend tortilla bowl. Don’t eat the tortilla shell and this becomes a pretty good option. I’m also pretty sure you’ll be better off making/eating breakfast at home. (Just sayin’). Adding deep fried potatoes rules this one out, sorry. “Ultimate” is on my list of Objectionable Food Adjectives, for good reason. Lower in sodium because they’re higher in sugar! I hope you enjoyed Seattle! Taco Time is one of those places that advertises about how “healhty” they are, but everything is packed with sodium, which is so frustrating. But, I wanted to point out one bizarre twist about Taco Time. They have two separate identities. On the West side of the Cascade Mountains, (e.g., Seattle), their menu is completely different from all their other locations. It’s at http://tacotimenw.com/. I don’t know why this is – but, it is. So, Seattle folks don’t get the same menu as, say, Spokane folks. They do have a few options on their “NW” menu that are a little better options, like some of their “Fit Hit” bowls (though they are still high in sodium). Just thought I’d toss that out there because it is a strange nuance of the ‘Time. Seattle was fantastic! I’m now convinced that the lousy weather is just a myth, propagated to keep people from moving there. I completely missed the different menu (and very different aesthetic, interestingly) of Taco Time Northwest! The NW menu definitely has many other options (fish tacos!). A quick glance at the nutrition information shows the sodium to be quite a bit lower, too. (Still too high, but with a little more time I bet I can find some better options than their Midwest Menu). This is absolutely fascinating. Obviously Taco Time is catering to two entirely different food cultures. As does any business, they’re responding to demand, of course. It reiterates that we vote with our forks and our wallets! It sounds to me like you got lucky with the weather. No, really, you came here the best time of year. August and September are phenomenal in Seattle. You are so right in that TT is catering to different audiences. I think the Seattle branches were the “originals,” as this is where their corporate office is. This may call for a Taco Time Part 2 post! Weird that Taco Time NW is only in WA and not in OR, since that’s what is considered the NW. After eating at Taco Time NW A LOT in the past three years of my clean eating LiveIt, I finally actually looked at the nutritional info and it made me absolutely sick to find out I’ve been consuming so much sodium. Never again will I ever set foot into a Taco Time – NW or otherwise. It is not worthy of a cheat meal.